One of my biggest projects this year has been working on the Nickolas Flux History Chronicles series from Capstone Publishing. When I tried out for the job, they were looking for artwork in the style of original series artist Dante Ginevra, who set a pretty high bar! 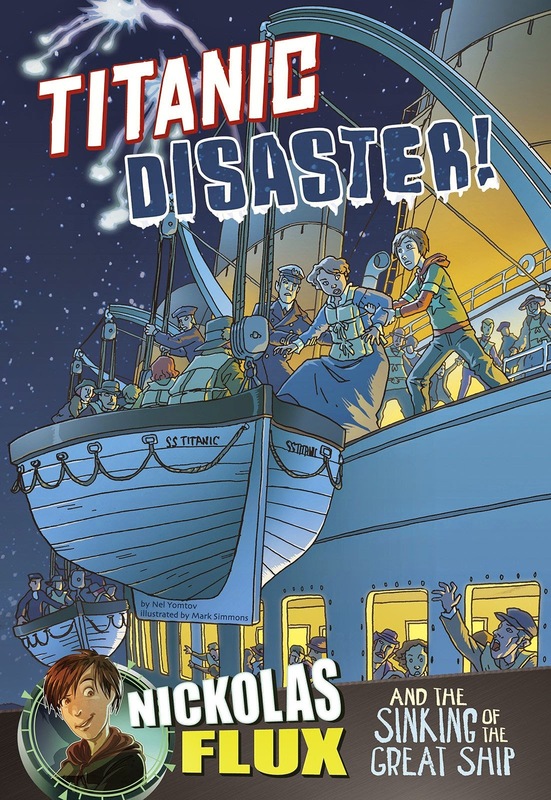 This is a series of educational time-travel adventure comics, distributed mainly to schools and libraries. The first two volumes I illustrated, Peril in Pompeii and Flight to Freedom, should be available now; I just got my contributor's copies a few weeks ago, as documented here. 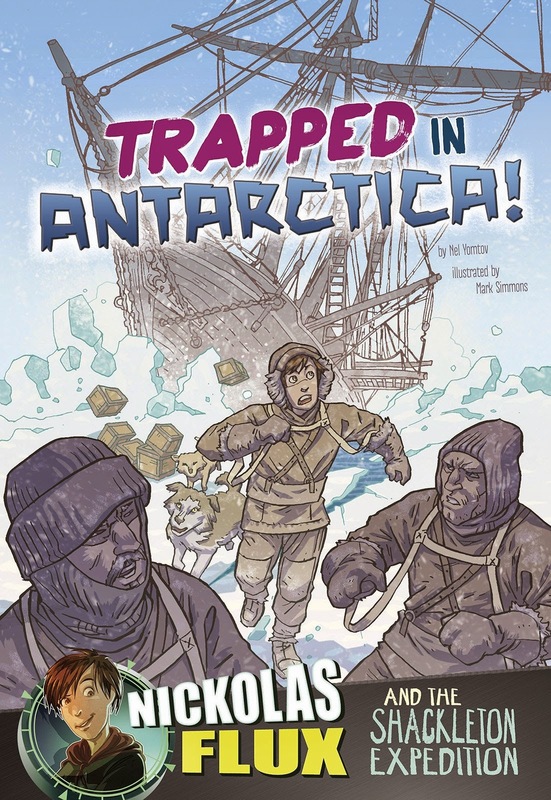 Meanwhile, I note that Amazon just posted the final cover artwork for Titanic Disaster and Trapped in Antarctica, scheduled for release in February 2015. These are the first books in the series for which I did cover art as well as interiors, so I'm pretty excited! 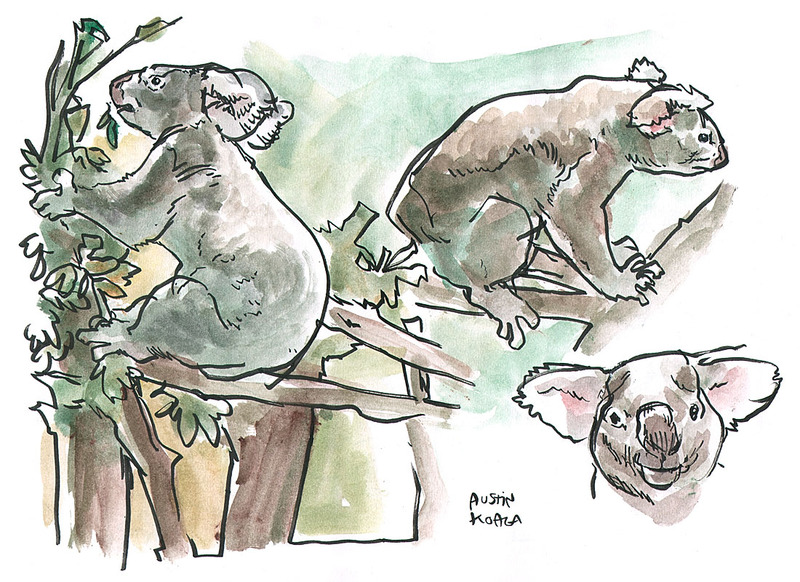 Back to the San Francisco Zoo for the second annual monthly free-day sketchcrawl with a passel of other artists. 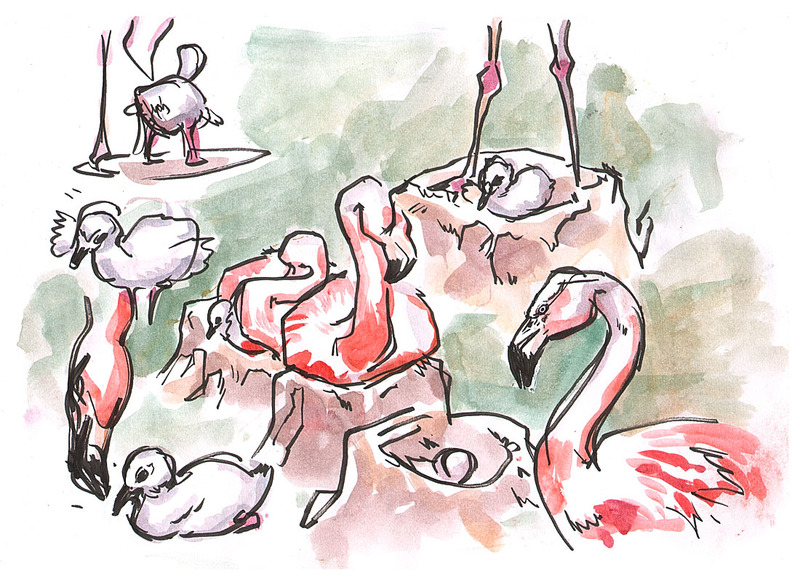 This time, we seek the wild flamingo chick and baby giraffe! 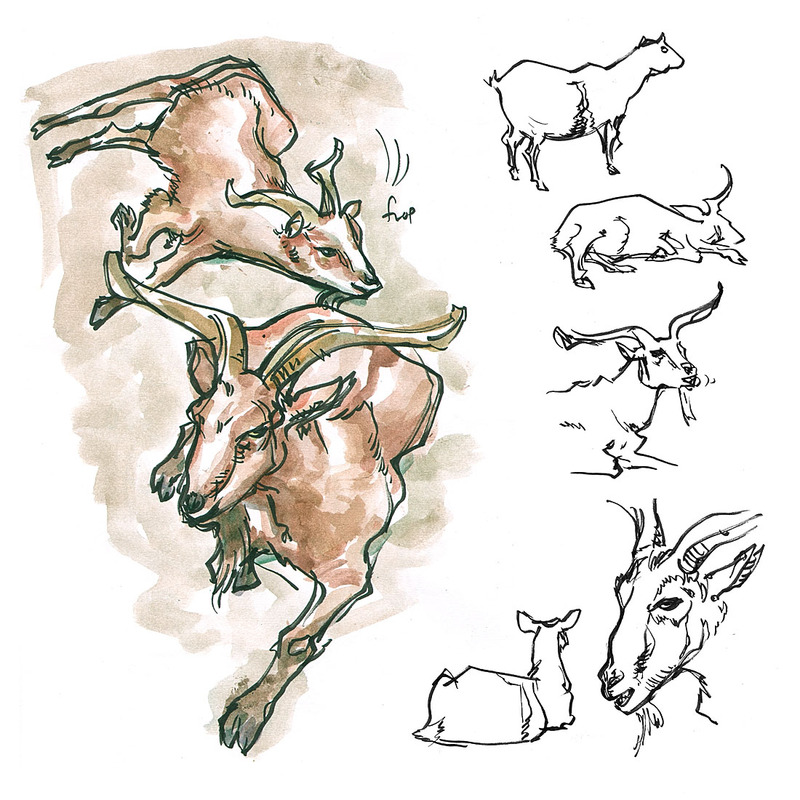 My wife keeps wondering why I don't draw the petting zoo goats. So Julie, this goat's for you! 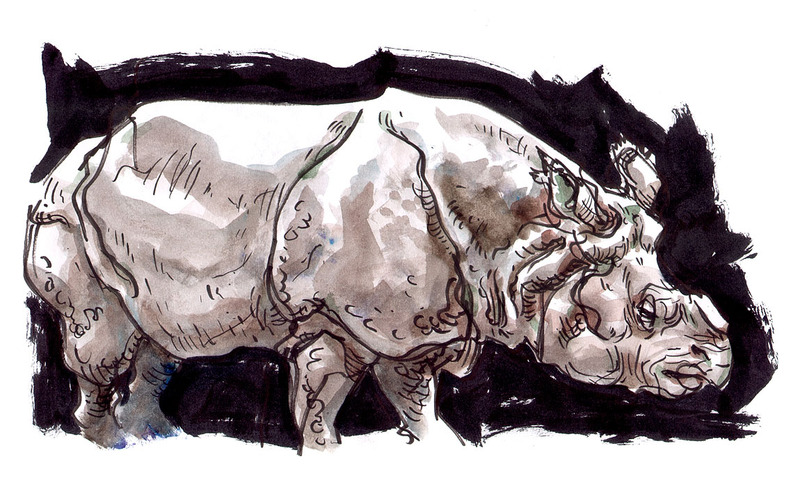 I believe this one's named Nutmeg. A newborn flamingo chick, the first of what's now a whole flock of flaminglets. 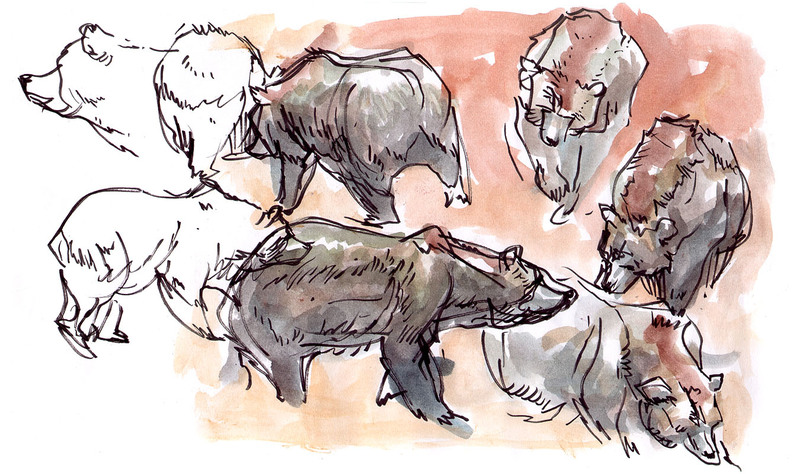 The daily grizzly bear breakfast rush is a great sketching warmup - talk about your high-speed gesture drawing! The rest of their environment, of course, is more accommodating about holding a pose. They have llamas! When did they get llamas? Nobody told me there were llamas! 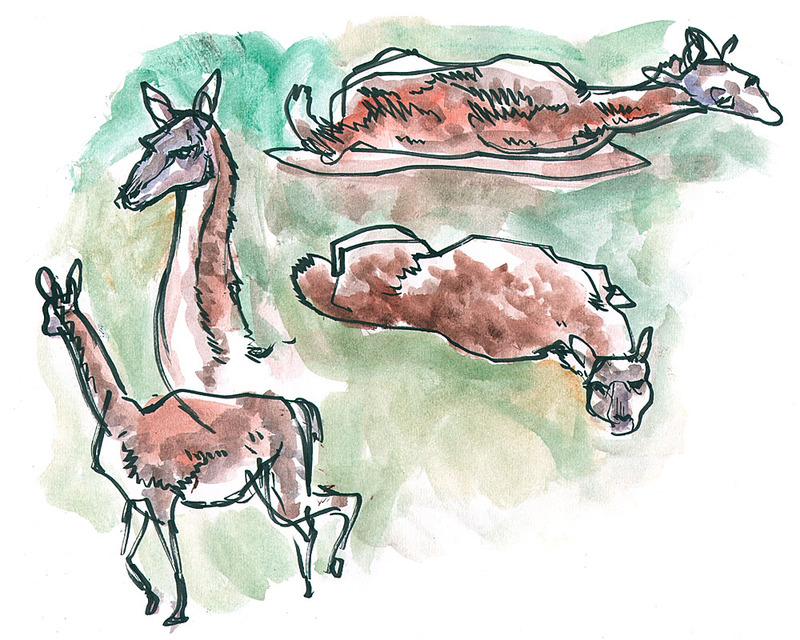 (Well, technically they're guanacos.) I hope you'll forgive the goofy head at top right. 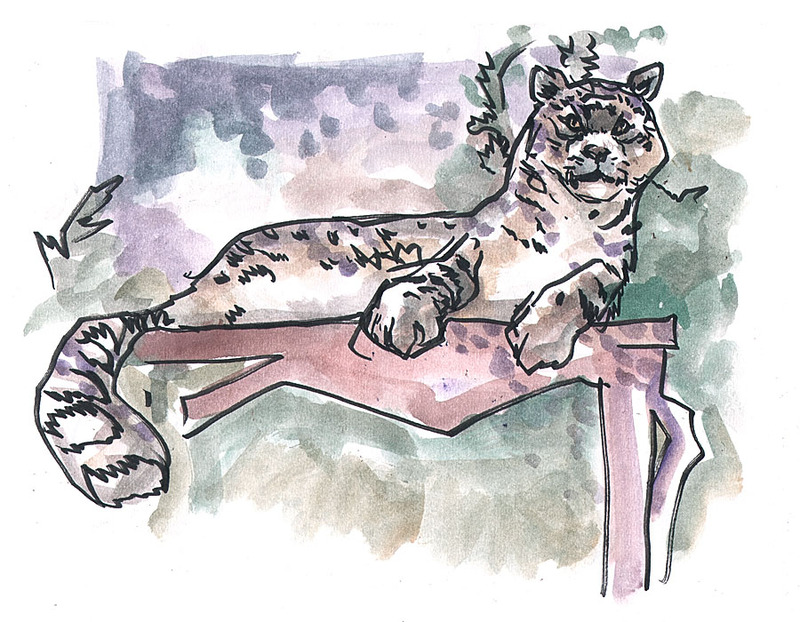 The majestic snow leopard is perhaps my personal favorite of the big cats. Over at the Animal Resource Center, we had some face time with a couple of rescued owls. The rarest of all sightings, a non-sleeping koala. 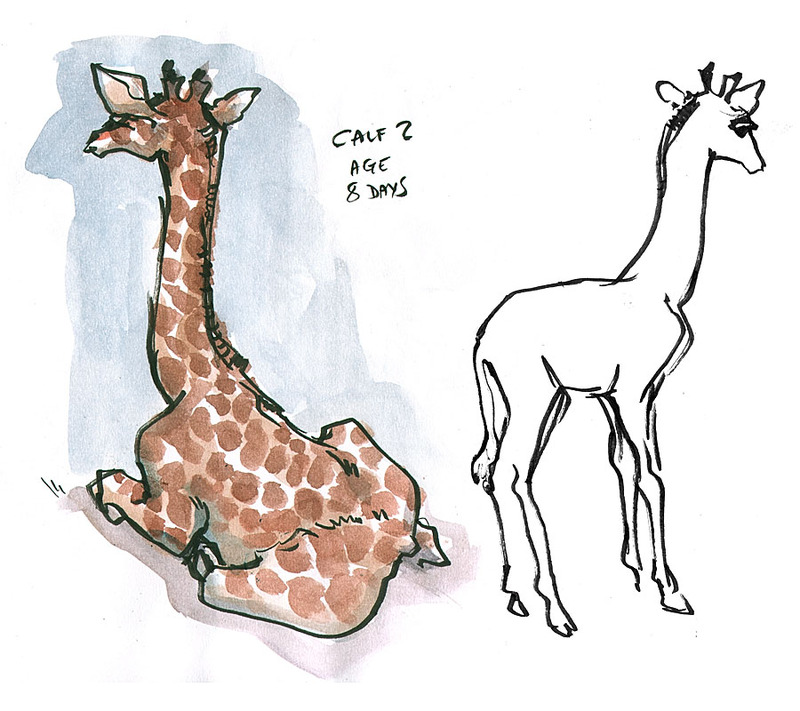 Saving the best for last, we paid a visit to the eight-day-old baby giraffe, currently known as "Calf 2" or "Buddy." 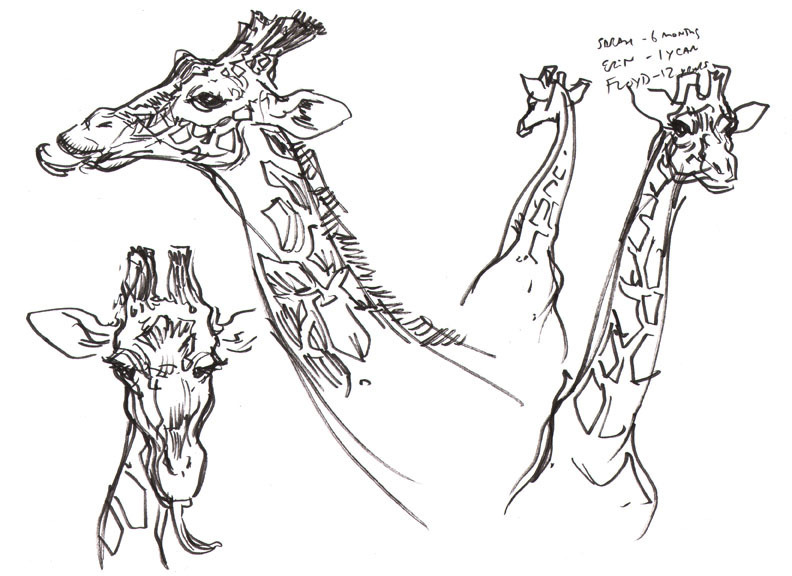 Another batch from the monthly San Francisco Zoo free day. 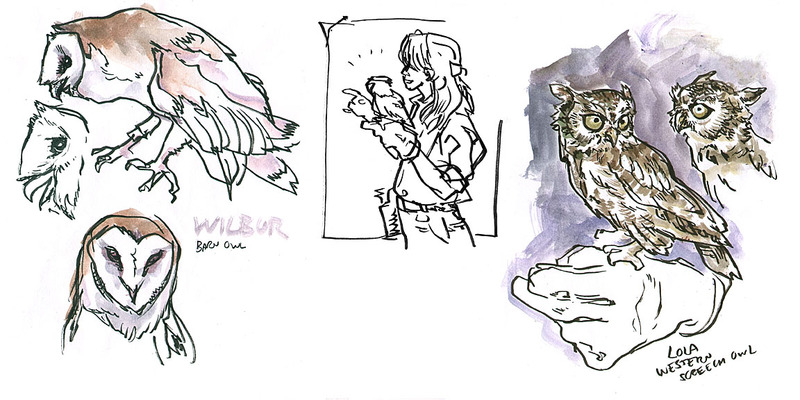 This time, I got to mob up with a bunch of other artists. Super fun! 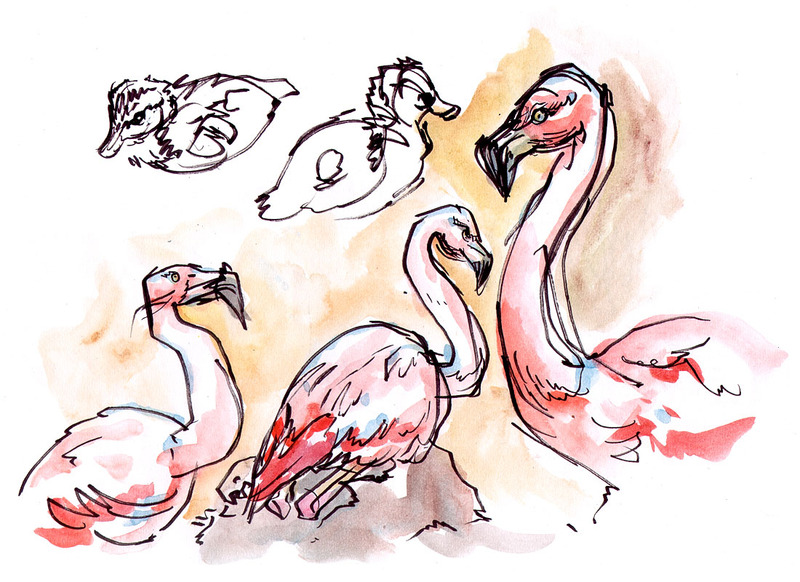 While we were gathering at the cafe, I went over to sketch the flamingos and discovered there were a bunch of baby ducklings too. I'm still trying to capture the fast-moving grizzly bears. Their 11:30 breakfast rampage served as a good backup meeting point. 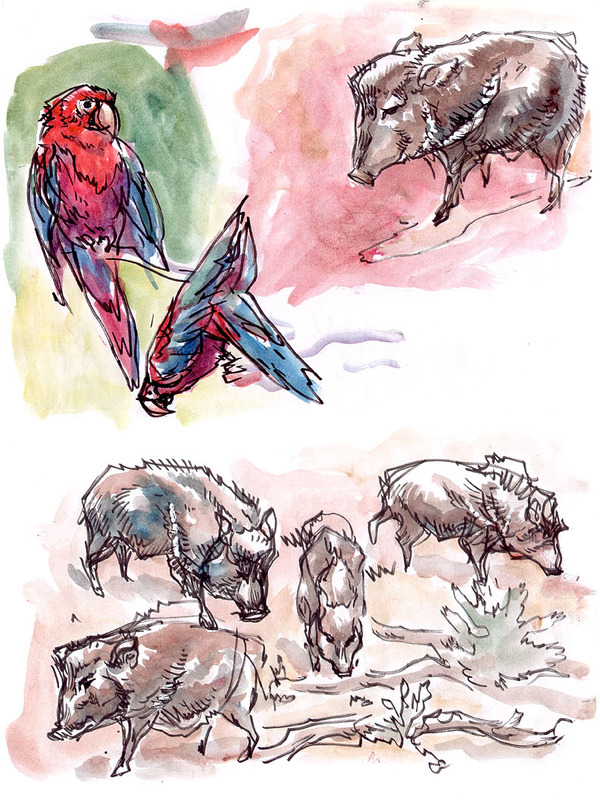 Green-winged macaws and the obligatory peccary check-in. 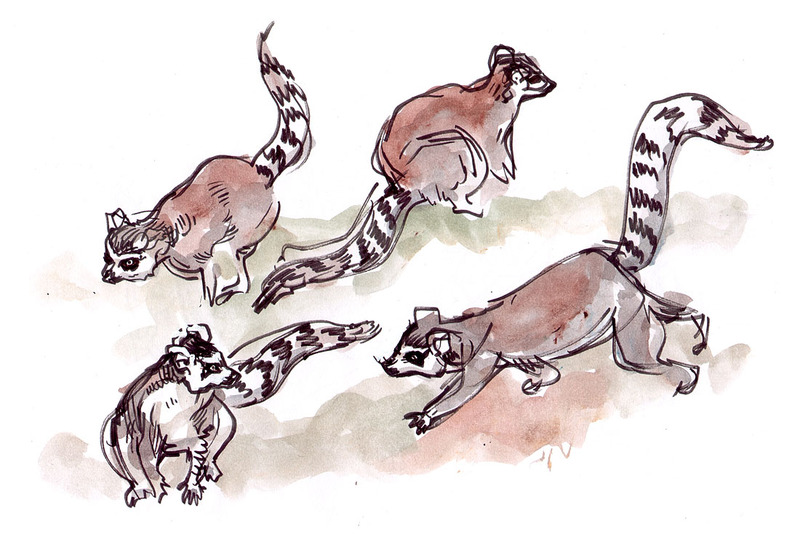 Everyone enjoyed drawing the majestic and highly sketchable Gauhati. Wish I'd left room for his feet! Today's Animal Resource Center show and tell: Tortoises, tortoises, tortoises! 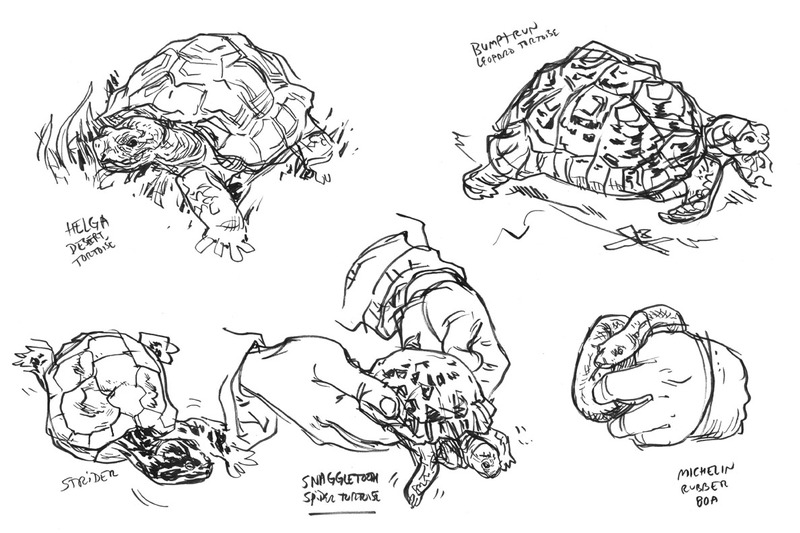 And a turtle and a little snake. We wrapped up at the giraffe barn for the traditional 4:30 feeding. And finally, post-zoo snacks at the Bashful Bull Too. 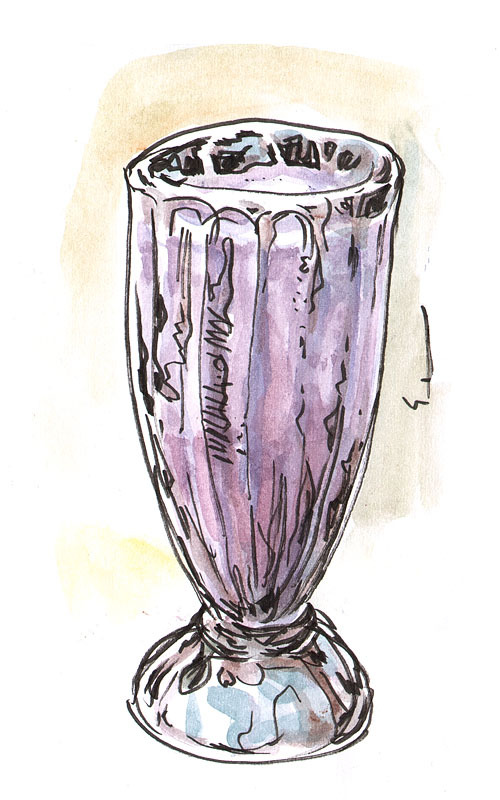 To illustrate some obscure artistic point I was obliged to draw Sasha Roukina's milkshake. 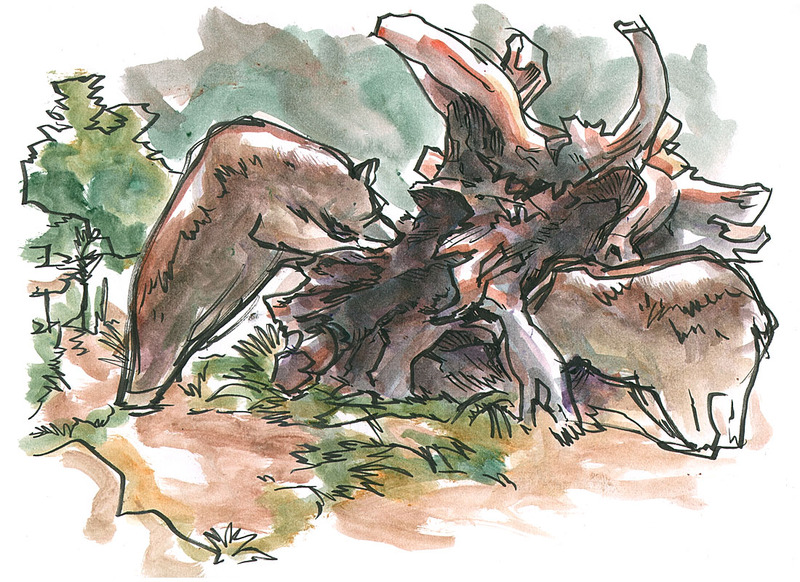 For more zoo sketching fun, be sure to check out Gary Amaro's recent post on the Urban Sketchers website!